It is a little bit funny seeing how this life turns our life up and down so easily. The other days you are at the top, find yourself as a winner and the next days you are very very very low at the bottom, far from the top, not even close to the surface. The other days your life go oh-so-smooth with no bumper at all just like driving in the highway and suddenly bumpers come out from nowhere and it’s everywhere. The other days you meet people as strangers and as the time passing you find they are your best friends and soulmates, while the person who you think will be your destiny leaves you. The other days you are so sure about your future and life path and then you realize it leads you to nowhere and you just turn around at the same spot, everything become so blur, and you don’t even have guts to decide where to go. Sometimes you feels so lonely, the other days you want to be alone. Sometimes you feel so normal, the other days you feel so weird. Up and down, down and up. Meh, that’s just a term. You still can be happy in both up and down. You can decide to be happy. Red and blue. Blah, that’s just the same. You can decide your own color to describe your feeling. Pink in tears, calm purple in anger, or blue in your laugh. Everything’s just sounds perfect for me. Heart and brain. Who’s in charge? Huh, who cares anyway? It doesn’t matter at all, feels free for that. Who knows, your heart and brain might be best-buddy now. Thoughts and feelings. No no! Never ever let others thoughts and feelings lead yours. You create your own, not them. Only your thoughts and your feelings can drive you. No, not other. Don’t let them control yours. Don’t let people put their standards to you. Have hopes. Have faith and love. Perseverance. Smile and be happy. Oh c’mon, don’t live your life too serious, don’t be so harsh to yourself. In the end, happiness is what everyone is looking for, isn’t it? Yes, happiness. Not accomplishments nor successfulness. But happiness. Only happiness. Here you are my paragliding view at Matantimali, Palu, Central Sulawesi, Indonesia. A spot with such a beautiful sight and thermal. Mountains, bay, city, forest in a single jump! Feeling afraid to jump? Man, you never know how amazing the landscape from above if you don’t fight your fear and JUMP! Just JUMP! I felt sorry for my self for experience this later, after I moved from Palu. All video captured and edited using iPhone 5s and iMovie. Song : That Feeling by We The Kings (Somewhere Somehow Album) & Halycon by Ellie Goulding (Halycon Days). Another written about Paragliding View. There you are, short video of our adventure in Togian Islands. We stayed in Kadidiri Paradise. An island with marvellous Sunrise and Sunset view. This Picture is taken by my brother, Sander Sonambela. No edit, Filter ND16. From several coral spots we visited, I found Hotel California Reefs is the most beautiful one. We also had a very excited time in Mariona Jellyfish Lake. The Lake filled with unpoisoned jellyfish. You can play with them! We had a sunny interested time in Bajo Fisherman Villages. Found unique acitivities and houses there. Milky way, stars, laugh and beers filled our nights. Togian Islands are perfect place to escape and get lost in there! All pictures and video are taken by iPhone5s, except Sander’s picture. Video edited using iMovie application. Let’s Get Lost in Togean Islands! Sea water shake this ferry. Warm sea air blow our face. We are on our way to Togean Islands from Ampana City. The famous islands in Central Sulawesi, Indonesia. I’ve been waiting this since years ago. And you have no idea what we’ve been experienced in last 24hours ago to reach this ferry this Sunday Morning, 12Oct 2014. We started from Jakarta on Saturday, 11th Oct 2014, 00.30AM with a connecting flight to Luwuk, one stop at Makassar. Based on our ticket the schedule will be Jakarta-Makassar 00.05-03.00AM and then Makassar-Luwuk 05.30-07.00AM. We planned to continue our trip to Ampana using public trasportation that scheduled at 10.00AM and planned to arrive at Ampana 8 hours later at 06.00PM. I already contacted my friend at Luwuk. They said we will have some snorkling on sea shore and beach sight seeing near the airport then have some breakfast before continue our trip to Ampana. And it sound perfect, isn’t?! I prepared my snorkling stuff and put at the top side of my 45ltr Deuter Backpack, so later I can reach this stuff easily when we arrive there. We were ready to go! Our flight to Makassar ran well and we had a good landing at Hasanuddin International Airport. Just a minor delay. We reported our connecting flight at transit desk. Suddenly we were informed that our flight is canceled and moved to 09.30AM! And we didn’t get any information either via sms or e-mail! What the heck!? The airline officer didn’t say sorry to us at all! Felt a little bit upset with the service we decided to complain at the airline arrival service desk. After we explained the situation, she said to us,”Ma’am would you ask the question to that employee who sat over there, she is more senior than me. She probably can help you,” while appointed her finger to a woman who had a chit chat with her friend. What?! Why we should go there and ask them? We were complaining to you, if you didn’t know the solution, you go there and ask her. Not us! I felt angry. Aniway, with that anger thank God still can talk with a normal tone to her. They told us to complain at the ticketing section, departure office. Not the arrival office. We walked to that airline departure desk, and re-told the story. Akh! Bad bad service. The officer insist that they already sent the notification one day before via sms and recorded in their system. Too bad that was not my number neither my friend, but phone number of our group member which is help us to arrange the ticket. I told him, with that flight reschedule I had to re-arranged my whole trip plan! (With a little hyperbolic and drama of course. :D) It’s a quite long argue with him until he said, they will refund if we want to cancel our ticket. We were arguing at 04.00AM! We found another earlier flight with another airline and add another Rp. 500k. Damn! Actually, I did’t know exactly whose responsible for this mistake, the airline or the travel agency. Aniway, I decide to argue with the airline officer first, then say sorry later if this is not their fault. Hahaha! It’s 04.00PM my maan, there will be no one will picked up your phone at the travel agency. We arrived 60min later than planned. The bright sunny weather welcomed us in Luwuk. My friend brought us to the beach near from airport to have a fun snorkling at shallow shore. The underwater view is breathtaking! Colourful corals and fish everywhere. I had to hold my breath so my big belly won’t crush the corals. And you can reach the spot just by 3 minutes swim. To bad our time in Luwuk were very limited. We still need to catched up the public transportation schedule to go to Ampana. It was scheduled at 10.00AM. We arrived at their pool by 10.30AM, they told us that the elf was still in the gas station queue. Oh man! We just commented and felt sorry and laughed at the long queue in gas station on our way to the pool, and our elf is in that queue! Our elf came later at 12.30AM. Now I felt sorry for my self and my friend, Ocha. Oh boy! Our way to Ampana was quite shaking. The road is not really good. Mmmm… The road is terrible actually. As an effect, when you talk at the elf, your voice will sound like robot. “Haaiiii how are you?” will sound like “Ha-a-i–ho-ow–are–yo-ou?” Hahaha! But out of that, the view is really beautiful. Just forget the shaking road and enjoy the view. We arrived at Ampana 7hrs later by 7.30PM. The other 7persons wait for us in the restaurant to have dinner. They welcomed us with jokes and laughs. Within few minutes we already drawn by funny conversation and plan discussion and forgot all the stupid things happened in that day. What a day, what a day! And here we are, by the next morning, sit nicely inside the ferry, public transportation to the Wakai, a small port in Togean Islands. Can’t hardly wait what will happen in these next few days. Haha! We woke up a little bit late that Saturday. 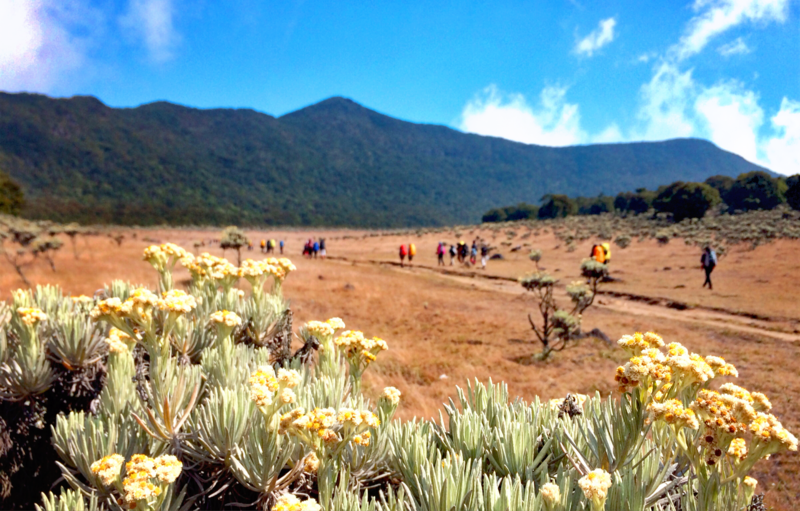 We were at Surya Kencana (2750 mdpl) , the large savanna on our way to Gede Mountain summit (2958 mdpl). We spent a night there before continue our hiking. Lots of other group also had a rest there. It was a really bright morning. I can hear other group was busy packing up their stuff before continue their hiking. The other still enjoyed their time, laugh and joking each other, while having their breakfast. I could see the sun smiling to us and say,”Hey you there!” The clouds was dancing together with the wind. Even The mountain blend with the happiness of all the adventurer. The edelweisses and the grass greet us a warm Good Morning. I heard leaves of the trees swayed. The air were really fresh. And I, I was sitting enjoy all of this rare beautiful moment. Yes, it took a lot of effort to get here, but it was nothing compare with this serenity. I guess this is the real church, Home of Thy God, just like Anthony de Mello said in his book The Prayer of The Frog 1. The church which is made by God’s own hand for us, is the nature. All we need to do is sit quietly and enjoy the view. 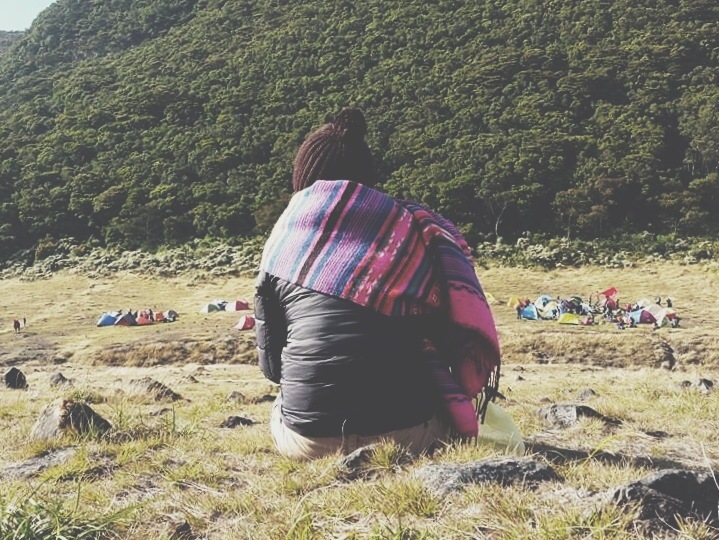 And if you closed your eyes and sang the praise to Him from your heart, you could hear every single part of the mountain sang together with you. Piano by the edelweiss, violin by the wind, celo by the tree leaves, you can even hear the triangle played by the grass. Rocks on percussion and harp by the clouds. All creatures bring their own colour to this concert. They put their best and create a great symphony of nature praise to their creator, the perfect artist, Thy God. I thanked You, God. For let me be part of the nature symphony in Your beautiful mountain church. And the best way to praise Him is taking care the nature. Because the nature is God’s real home.